Want to do a Whole 30 or other paleo-style diet? Here are the recipes to make it easy! I had a pretty successful Whole 30 back in 2013. I didn’t switch to paleo, but I enjoyed the challenge. My parents have both lost 20 pounds in doing a Whole 30 recently in 2015. 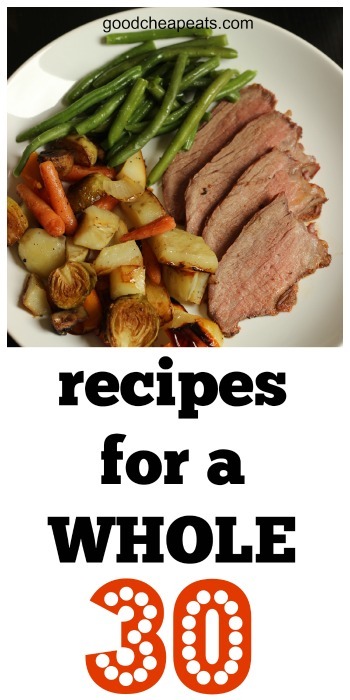 The recipes below are very Whole 30 friendly. If you’re a visual person, check out my photo Whole 30 main dishes database. 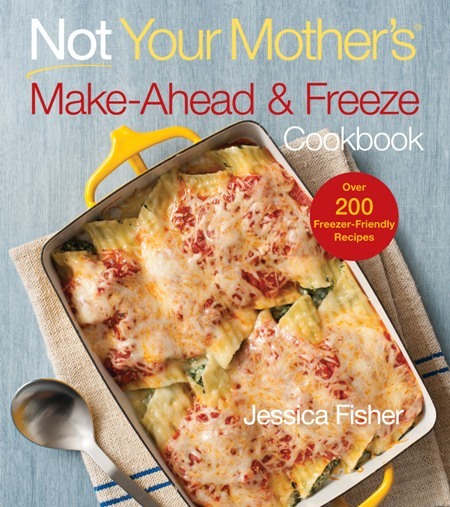 It contains newer recipes as well as the ones listed below. Want to cut to the chase? 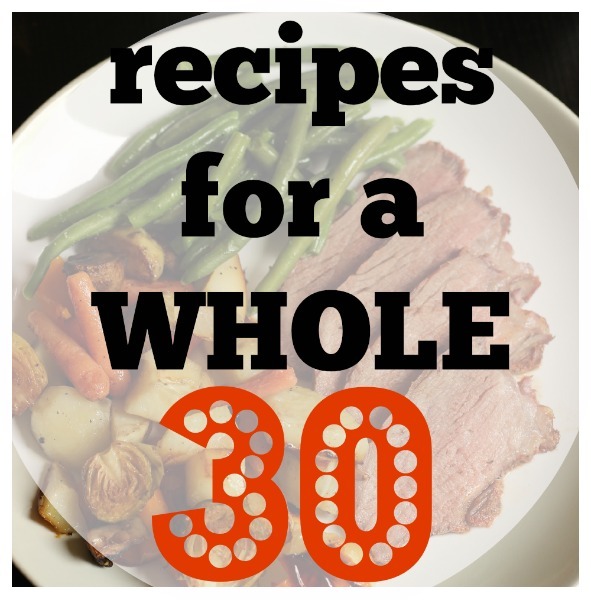 Grab the weekly Whole 30 meal plan and the Whole 30 freezer cooking plan. This post, How to Prepare for a Whole 30 can be super helpful in your preparation and this one, How to Make Healthy Eating Easier, can help you keep at it. Please be sure to read each recipe carefully as there are Whole 30 adaptations added. Fresh Guacamole: It’s a Fine Thing! Buy the book here. Thanks for supporting this site! My second cookbook, Good Cheap Eats, was written while I was doing the Whole 30. Many of the recipes are very adaptable to the diet. Hi, do you have any recommendations on bulk cooking and/or freezer meals for a diet that is very restricted to sodium, fat, and cholesterol? We can’t use any processed foods. Thanks. im very excited to try this! Do you have a vegetarian menu, no sugar, no wheat no dairy? You’ll have to check the Whole9 website for a vegetarian option. I’m so confused…you have a list of recipes you label as good for Whole 30, but in the eggplant link, you have red wine in one recipe and show pasta in one of the photos, neither of which are Whole 30 approved. Can you clarify? Each recipe page should have an explanation of how to adapt it for the Whole 30. It’s possible that I missed one. However, in the bolognese, you would simply omit the red wine. Serve pasta SAUCES over vegetables instead of pasta, like spaghetti squash. I will make sure that those adaptations are clear. Thanks for your question! The post roast recipe calls for beer. This list is not very trustworthy, apparently. As I explained to Kathleen, there are adaptations explained in each post. The pot roast post is not a “recipe”, but a demonstration of the method of HOW to make a pot roast without a recipe. While there is a picture example showing beer, the method explains to use some type of liquid and lists options to use. Super thankful for this website and all the hard work you put into it! I am preparing to start Whole30 in a couple weeks and this list has helped me to feel a bit less overwhelmed about the meal planning and prep. I think you showed it on here at some other point, but I cannot remember where I found it… what do you use as a mayo sub in the caesar dressing? Would just olive oil work, or do you usually add something else? I’m putting together a Month of Meals plan that will work for the Whole 30. Really excited about it since I’m going to try to switch my diet that way. I make my own caesar dressing and my own mayo when I’m doing whole 30. That way you can control the ingredients, and avoid soy. Can you share your homemade Caesar dressing recipe please, for those of us who want to try whole 30 and need some variety in our dressing choices this month? Thanks so much for always posting yummy recipes…I love your website and practical information, that I can easily use for my family of 6. I actually have three different recipes that I use on a rotating basis, depending on my mood and audience. Obviously, you’ll omit croutons and cheese for Whole 30. 1) https://goodcheapeats.com/2013/03/poormans-chicken-caesar-salad/ requires that you use complaint mayo for Whole30. 2) https://goodcheapeats.com/2009/05/caesar-salad-fine-thing/ – These days I use a pasteurized egg and add the yolk only. You can also just omit the egg. Sometimes I add anchovy paste. 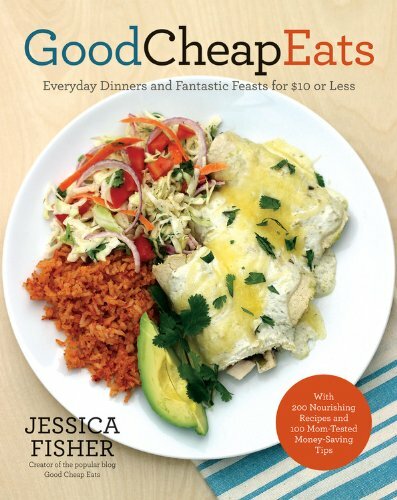 3) is in my book Good Cheap Eats Dinner in 30 Minutes or Less. It calls for fish sauce. Thanks for your kind words! I’m so glad it’s helpful to you! Thanks for all of the tips, tricks, and recipes! Your website has been super helpful as I put together our whole 30 plan! !